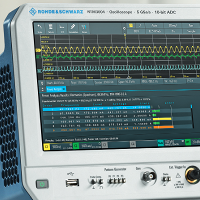 The new scopes range from the affordable RTC1000 2 channel digital oscilloscope with bandwidth options from 50 to 300MHz, through the highly capable RTM3000 digital oscilloscope with 2 or 4 channels and bandwidth options from 500MHz to 1GHz and the RTA4000 4 channel digital oscilloscope with bandwidth options from 200MHz to 1GHz. All feature colour capacitive touch screens with intuitive interfaces, and low noise front ends. The latter two have vertical resolution down to 500µV/div.